Geralyn Frandsen is the director of the undergraduate nursing program at Maryville University. Over the course of her career, she has gained extensive experience with patients spanning every stage of life, from pediatrics through elderly and end-of-life care. 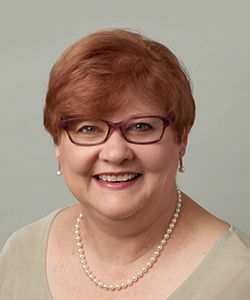 Dr. Frandsen practiced as a nurse for a decade at the Visiting Nurse Association of Greater St. Louis, and she earned her Doctorate of Education in higher education from Saint Louis University, where her dissertation focused on mentoring. She obtained her master’s degree in community health nursing and nursing education, and remains focused on developing the best possible practices for mentoring nursing faculty and nursing students. She is the co-author of a pharmacology textbook, Abrams’ Clinical Drug Therapy: Rationales for Nursing Practice. Berman, A., Snyder, S., & Frandsen, G. (2016). Kozier and Erb’s Fundamentals of Nursing. (10th edition). Upper Saddle River, NJ: Pearson Publishers. Frandsen, G. & Pennington, S. (2014). Abrams’ Clinical Drug Therapy. (10th edition). Philadelphia, PA: Lippincott, Williams, and Wilkins.